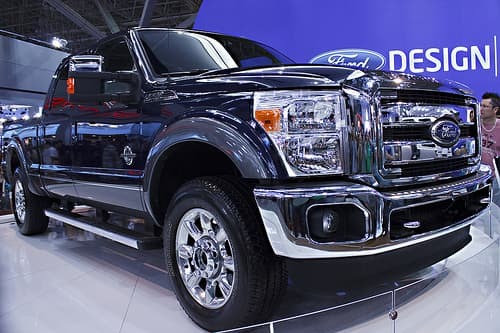 Ford has long been at the forefront when it comes to technological innovations, especially related to their award-winning F-Series line of heavy duty pickup trucks. The latest innovation, recently announced at the State Fair of Texas, has to do with the second-generation 6.7-liter Power Stroke V-8 engine. Engineers have been working on improving the original design since its 2011 release, and have made a variety of improvements aimed at increasing both its power and efficiency. The original 2011 Power Stroke had what Ford engineers referred to as a “reverse-flow layout.” On the new Power Stroke, the exhaust is placed inside the engine’s V shape while the air intake is on the outside, which results in a variety of improvements. One such improvement is its turbo responsiveness, an important component responsible for generating torque. This is the result of reducing the path of the airflow from the exhaust to the turbocharger. Additionally, the 2015 Power Stroke has reduced and isolated high engine temperatures by placing the turbo inside the engine’s valley. This helps to improve efficiency and reduces the amount of vibration and noise. The turbocharger itself has also been upgraded. The old GT32 model has been replaced by the GT37 model in the new Power Stroke. The GT37 is larger than its predecessor, using a single 88-millimeter compressor with a turbine size of 72.5 millimeters. The increased size of the GT37 results in increased power simply because of the larger surface area of the turbocharger. This new Power Stroke will help to ensure the long-term viability of the Ford F-Series, a line of trucks that has already been extremely popular for many years. The improvements mean a number of things to prospective truck buyers: Increased power and efficiency, better towing capabilities and better overall performance in a wide variety of potential uses. With the new improvements to the 2015 Power Stroke, Ford has once again positioned itself among the forefront of engineering innovation. The original incarnation of the 2011 Power Stroke was impressive in its own right, but the 2015 is far superior in it ability to efficiently increase power and performance.